Chor der Hamburgischen Staatsoper, Philharmonisches Staatsorchester Hamburg / Johannes Fritzsch. Staatsoper, Hamburg, Germany. Saturday, February 27th, 2016. This was certainly an evening that promised much. A cast notable for some Wagner singers with established and burgeoning reputations and the excellent Hamburg house forces meant that this was definitely a must-see. In many respects it delivered and tonight was a performance that was unquestionably about the singing. Marco Arturo Marelli’s staging is only 20 years old. I write only because it looks much older. As a production that is easily revivable to accommodate different casts, it works well. However, the principals spend a lot of time facing the front, barely looking at each other and far too often resort to stock operatic gestures. There were a couple of exceptions – when the Holländer and Senta first see each other there is a striking moment when they gradually walk towards each other across the room. Towards the end, in their final duet, Erik and Senta strike sparks off one another as Erik tries to convince Senta to stay with him. Indeed, whenever Ricarda Merbeth’s Senta and Andreas Schager’s Erik appeared together, the dramatic temperature on stage rose exponentially. The chorus was well-drilled and effected their movements accurately and the show had clearly been revived with precision and care for the original Regie, it’s just that I craved something to make me think, that made me reflect on the work afresh. Nevertheless, the evening flew by due to some truly outstanding musical performances. 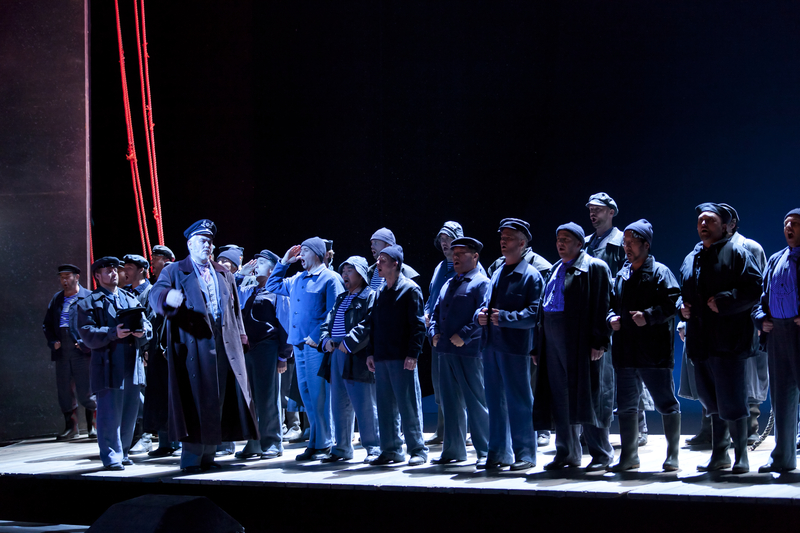 Der Fliegende Holländer at the Hamburgische Staatsoper © Brinkhoff-Mögenburg. Ryan McKinny was an interesting Holländer. His voice initially struck me like a fine Barolo, a fascinatingly complex instrument with rich depth of tone and a voice that sounded quite broad. Ultimately however, it felt that the role was slightly big for him and he sounded audibly tired towards the end, the top not quite as strong as it was at the beginning. It is undeniably a beautiful instrument and the complexity of the tone is captivating to listen to. Another thing I noticed is that he made no distinction between the ‘ch’ and ‘sch’ sounds, a minor thing perhaps but given how clear his diction was, it would have been nice to hear the distinction made. I last heard Ricarda Merbeth as Chrysothemis in Paris three years ago where she was the only singer in the cast audible in the difficult Bastille acoustic. Tonight Merbeth was absolutely glorious as Senta. She took a few minutes to warm up, but once past that, the voice displayed remarkable security throughout the range. Indeed, during the ballade, she nailed the awkward tessitura with ease and it felt that one was hearing the fruits of long practice in the effortlessness with which she navigated through the passaggio. The voice is so well produced – it’s a bright, forward sound – that when she sings Senta’s high declamatory writing, there is no sense of strain at all. This is a voice that has clearly been looked after and has bloomed beautifully. Her debut as the Siegfried Brünnhilde in Berlin next year will surely be unmissable. When Merbeth and Andreas Schager appeared on stage, the performance took off musically as well. Schager really is a phenomenon. It’s hard to describe how absolutely massive the sound he produces is – and Merbeth most certainly held her own with him. Yet as I mentioned during the Flanders Tannhäuser in Ghent, his singing isn’t just about pure volume. He finds so much poetry in the text and brings the words to life. He also shades the voice wonderfully so much so that in his final duet with Merbeth, I seriously wondered why she didn’t stay with him. The vibrations are absolutely even and he is an extremely engaging actor. This is the kind of voice that one really does not hear every day. Reinhard Hagen sang Daland with good resonance at the bottom of the voice and an easy line. Dovlet Nurgeldiyev’s Steuermann was sung with a plangent tone and a highly elegant line. Certainly a singer I’d like to hear again. Anja Schlosser’s Mary made much of little, the diction clear and the tone ripe. The gentlemen of the Hamburg chorus sang with fabulous amplitude making a colossal noise in ‘Steuermann lass die Wacht’ though both they and the ladies had a couple of individual voices sticking out on occasion and the ladies’ tuning in the Act 2 opening chorus could have been tighter. Johannes Fritzsch set his stall with an overture that was salty with sea air. His reading was well paced and gave the singers the space that they needed. He was a sensitive accompanist yet he also kept the drama flowing to its conclusion in a way that the hours flew by. It wasn’t perhaps the most memorable or distinctive reading but it was highly professional and well done. The quality of the Hamburg orchestra is unmistakable and every section covered itself in glory tonight. The brass was magnificent – the horns especially in that crucial motif – the woodwinds full of character and the strings absolutely secure at all times with impressive depth of tone. Tonight was a highly memorable evening in the theatre, one that left me in awe of some truly significant voices. Yes, the production is more serviceable than inspiring but it had certainly been revived with great care for its spirit. It was musically excellent, well worthy of the outstanding standards of this theatre and capped by some absolutely spectacular performances.